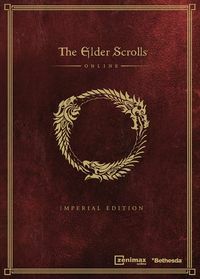 The Imperial Edition was the collector's edition of The Elder Scrolls: Online. It was included with additional exclusive content. A copy of The Improved Emperor's Guide to Tamriel. A 12" Molag Bal statue. The ability to play as an Imperial in any alliance. Access to the Imperial style in the Outfit System regardless of motif knowledge. A Nibenay Mudcrab vanity pet. The Explorer's Pack and a pre-paid 30-day subscription, which were otherwise only available by pre-ordering. As of the introduction of Homestead with Update 13, the ability to purchase Imperial-style player houses. This includes the Cyrodilic Jungle House in Baandari Trading Post (0007100071,000  ), Domus Phrasticus outside of Elinhir (00295000295,000  ), and Strident Springs Demesne outside of Arenthia (012800001,280,000  ). Several players who pre-ordered the digital Imperial Edition for PC/Mac also accidentally received a pet Rufous Mudcrab. Those who bought the Imperial Edition on Steam before 21 July, 2014 also received a Whiterun Wolfhound. Originally available through the PC/Mac Store and Steam, the Digital Imperial Edition Upgrade can now only be purchased through the Crown Store. Crown Store upgrades act on a per-server basis; if you want to upgrade your Standard Edition on both servers, you will need to buy the upgrade twice. Additional Pledges of Mara can be bought separately in the Crown Store. Unlike the Crown Store upgrade, any Imperial Edition upgrades purchased from the PC/Mac Store or Steam were not server-bound and applied to all PC servers. PC/Mac players who copied their account to PS4 and Xbox One maintained their Imperial Edition status had they previously purchased it. This page was last modified on 24 February 2019, at 01:41.